I woke up in the Chu nation's earliest capital, 丹� Dan Yang. It is like you are in a remote mountain, our hotel looks like a grade school where farm people come and go. We checked the computer system, it was crawling at a snail’s pace. Around 700 BC, Chu capital was relocated from Henan province's Dan Yang to Hubei province's Zigui, Ying Du, capital of the State of Chu. 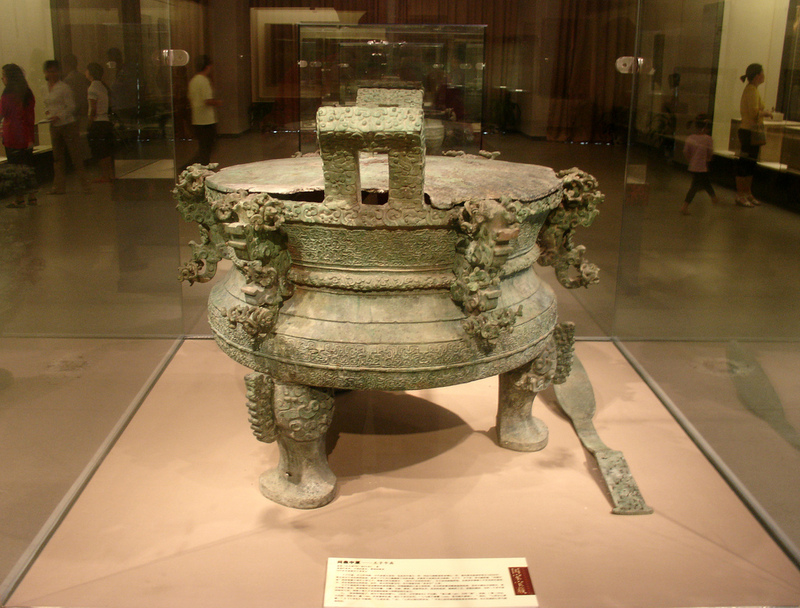 Chu Chuang King's son, prince Mi Zigen ( - 552 BC) Ding is now the most treasured item in Henan museum. See Photo. His Ding was unearthed during the construction of the Dan River Reservoir. The reservoir water receded during autumn October. It was left on sand. In 506 BC, Wu State annihilated Chu's relocated new capital Yingdu. So eventually that is why Chu citizen Fan Li served to assist the Yue country to finish Wu. I started to understand why Fan Li was so driven to finish Wu country. Rarely anybody would point out his motive is really to teach the enemies to not trespass on the other's capital with blood. Mark asked me: So your grandfather saw the ancient Chu kingdom city before it was submerged in the Dan Jiang river mouth reservoir? Vehemently, I replied: I am positive he knew all about the construction of the dam and he must have suffered pain because it destroyed the city. My grandfather was relocated to Shanxi to teach Chinese medicine in the Medicine institute. According to one relative, he cried every Chinese New Year when he posted the �β� antithetical couplet on the wall, as he did not know if my father was alive. I juggled the ancient Chun Qiu era history with modern day history. In 1958 the Dan River Mouth dam reservoir was started, and October 2005 the dam increase height project was completed. This is to enable the Nan Shui Bei Diao (South water relocated to North) Middle Line work to make the normal water level at 170 metres. But the problem is that this doesn't consider that this region has Karst geology and the dam was not soundly designed. "By the way, the mastermind behind this project, Hu Jintao's office manager, Mr. Ling Jihua, his only son was killed by accident." So do you believe in karma judgment for an evil scheme against Nanyang's environment and resources, with no respect for the land and the people? You know, you take my water, destroy my land, take my oil, and in the end, give me nuclear plants high above on densely populated area with 10 million people in Nanyang Prefecture. "Right, Nanyang is the last place that needs nuclear", a senior Zhongyou (ROC China Oil company in Taiwan) staff Mr. Han told me. At this moment, "Good Morning!" James smiled cordially. "We will be going to see the Chu Great Wall." "You must be excited, as that was your top priority when you contacted me via cell phone." "Right, I'm eager to see it. We are ready now." We stepped out the hotel and faced very piercing sun and started to journey to see the earliest grandfather Great Wall -- the Chu Great Wall, 2700 years old. The search for my roots has great contributions to enhance my understanding of Chinese origin and the books' annotation. After driving for some time through the hilly region, we came to a flat open brick-covered area at the base of some hills which did not look that impressive. There was a inexpensively-constructed and poorly maintained Chinese garden with water ponds, that looked like school playground, with some paths around the grounds. Our tour guide took us along one path that didn’t seem to go anywhere, but eventually arched off towards the right and upward toward the hills. After climbing for about 20 minutes, we reached a covered pavilion and rested and drank water. We asked James if we were almost there, and he said “about halfway”. We climbed up the steps which grew increasingly steeper and narrower. Eventually it became less steep, but the modern paved path ended, and we walked along an old dirt path, as if we were travelling back in time. Then, we saw something inset into the mountain, which looked pretty ancient. But still no discernible great wall, just the dirt road into a light forest. Then, finally we saw a low wall with bricks and piled stones along a ridge, with forest all around. I walked away from the path, and found a little section of a wall of piled rocks, with trees growing around it. This is the Chu Country 700 B.C. Great Wall. I said that this has to be it. James the tour guide just nodded, because he was tired from all the climbing. Between Qin country and Chu, there was a stone border fence; it is called the Chu Great Wall. The wall was not very high, about 4 or 5 feet, but stretched as far as we could see in both directions. But it was tall enough that it was difficult to climb over or for a horse to jump over, as it was in a forested area. Most likely the original wall was taller but the stones at the top had crumbled and fallen. At the top of the ridge looking down toward the valley, I see that this used to be a battle ground for the Great Wall soldiers to sling arrows to resist the Qin soldiers’ invasion from the valley down beneath. This might be James' first time too, per my request to visit the Chu Great Wall. Not many tourists visit here, which is why there are no signs, and the path to it has not been built up. James pointed at the valley down the slope from the wall, Look! Many battles were fought here! Indeed, the Qin Country was very militaristic and expansionist, it was the terror of the times. Six other countries had to band together to resist them, but over the centuries they were all eventually defeated by Qin. We were so unfortunate to be the direct neighbor. This Chu Great Wall attested to the defense against being conquered. In 700 B.C., the Chu capital was relocated several hundred miles to the south in order to avoid being so close to Qin, however in the course of close to 500 years, the Qin rose to a mighty power, and swallowed the six countries by 221 B.C., but the Qin empire was very short lived, facing many revolts and ending at 206 B.C. This teaches that Qin can't conquer all of China for long, as six other countries would revolt. I'm so fortunate to request to visit Chu Great Wall as I did the research on the web site. All of the travel enhanced my knowledge a great deal, so I could come to grips with ancient Chinese history, as I feel that I am face to face with them, standing on the same soil with the same trees around. This is a reminder that it was the brave Chu people’s who dared to say no to Qin brutality. This first uprising ultimately contributed to mighty Qin’s ultimate dissolution. I was pleased that we saw one section of the ancient Chu Great Wall; afterwards we came down the steps in very hot sun. My face would suffer dark blemishes for many years to come. We drove to a River wharf. It is a town built in the ancient style, which has been converted to a business tourist area, almost like a film studio. During the Mingguo Nationalist era, it was a port hub for cargo distribution. A man said that his mother was betrothed to here from Luoyang at head of 200 boats with cargo from Shanxi. She was in the first boat and she saw a tiny serpent jump into the boat. That calmed the torrent during the storm, so to thank the spirit. They constructed a temple, called Little Red Spirit Serpent Temple. We saw women still making shoes by hand. That is no way to make any big bucks. Currently it is the point of three provinces, Henan, Shanxi, and Hubei Provinces. We reached to three provinces converging point at sunset. That is the final tour on the west side. We will take care of the east side, when we have more time, the next time we visit Henan. We returned home to Nanyang in total darkness, flying like a shooting star. We were lost. The driver stopped the car to ask directions, GPS wasn’t available just yet in October of 2004. Now I understand what the phrase means "Returning heart like an arrow". We arrived in Nanyang so joyfully.